This is a very pretty garden close to Canterbury in Kent, England. I have to own up to the fact that it isn't mine. It belongs to my sister-in-law who puts lots of passion into it! 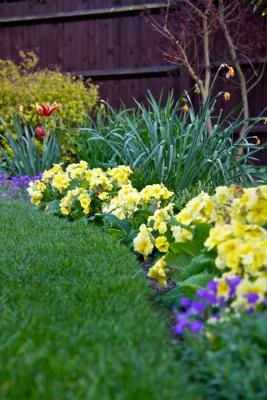 There are beautifully shaped lawns bound by flower borders that seem to have something to offer in every season. It's a wonderful place to sit and enjoy the colours and scents of nature especially with a cool glass of Chablis! Glenys' Reply Very pretty! Thanks Carol. Even though my parents were Welsh, I have to confess I've never been to Britain. But it won't be long. I'm determined to get some great photography done in the UK. This is definitely a picture that is calling out for a relaxing visit. What a beautiful way to frame a home! This picture is very pretty, so typically English. Like you Glenys I would love a photo trip to the UK especially Scotland.. castles and mist!